It doesn’t quite feel like spring is officially here until asparagus has been spotted, does it? 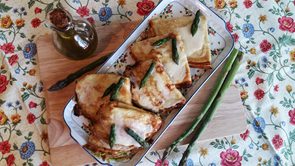 In Italy, the harvesting season takes place from the end of March until May and we’re looking forward to eating as much asparagus as we can until its brief season is over! 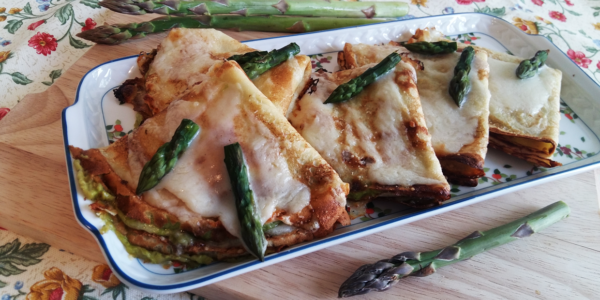 I love crèpes because they are a suitable dish for all type of occasions: a romantic dinner, a snack with friends, a brunch… so today I want to share with you my delicious crèpes made with asparagus! An easy and comfort dish that you can prepare in advance and warm it up when needed. 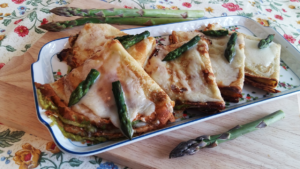 I will also show you my recipe to make a homemade asparagus patè but don’t forget that you can always use our delicious artisan asparagus Patè with any of your favourite recipes. This versatile Pâté d’Asparagi has a smooth and creamy texture that is always pleasant to taste. You can use it straight from the jar as a spread and topping. Spread on tarallini, bruschetta, crostini or sandwiches. 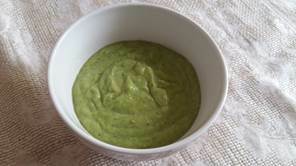 Great as salad dressings or add few spoons to your soups and stews. You can also make a quick and delicious plate of pasta. 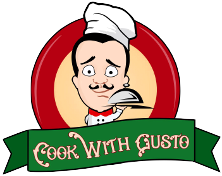 Simply, heat the paté in a saucepan and add few tablespoons of the pasta cooking water to dilute the sauce. Add the drained pasta to the saucepan, then mix well. It is also great as a sauce for meat or fish dishes. 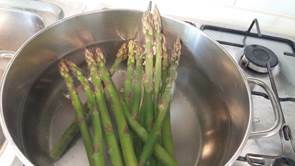 Find out more details about asparagus in our article: “Asparagus, the Spring Table King”! First of all, prepare the crèpes mixture. 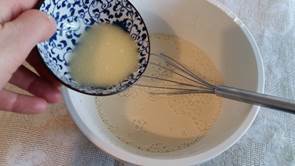 Sift the flour and mix with the milk, stirring well. 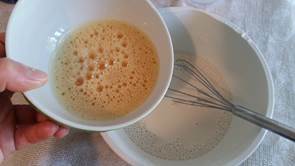 In the meanwhile, beat the eggs with salt and then add them to the flour and milk mixture. Finally, add the melted butter and stir all together, obtaining a smooth mixture. Cover with cling film and let it rest in the fridge for half an hour. Warm up the milk, previously seasoned with nutmeg and pepper. Melt the butter in a second pot on a low heat, and add the flour. Stir very quickly, avoiding clots. 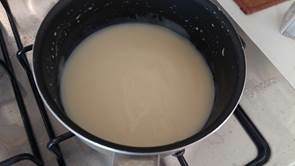 When the mixture will be uniform, add the warm milk, add salt, and keep stirring until thicker and smooth. Wash the asparagus and snap off the bottom inch or so. Then, cook them in a pot full of boiling water, placing them vertically. Saving the tips from the hot water. As they will be tender, remove them from the water and chop into pieces. Save some of the tips to decorate at the end. 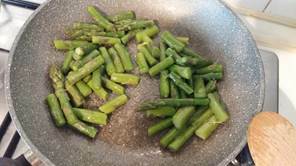 Fry the pieces in a pan with 30g of butter for 5 minutes. Adjust salt and pepper, and turn off the heat. 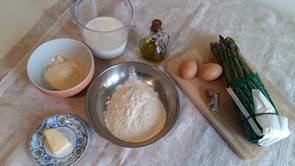 Blend the asparagus in a mixer, and gradually add 3/4 of the white sauce, combine them with the blender. 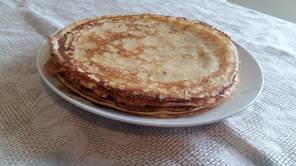 Start preparing the crèpes: heat a lightly oiled griddle or frying pan over medium-high heat. 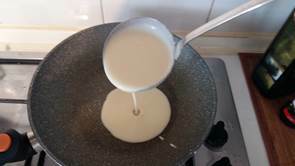 Pour or scoop the mixture onto the griddle, using approximately 1/4 cup for each crepe. 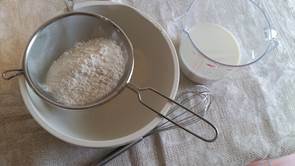 Tilt the pan with a circular motion so that the mixure coats the surface evenly. Cook the crepe for about 2 minutes, until the bottom is light brown. Loosen with a spatula, turn and cook the other side. 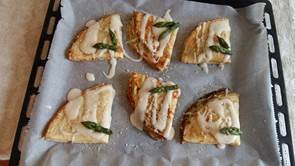 Fill the crepes with the asparagus patè and sprinkle with grated swiss cheese. Fold into quarters into a triangle. Place the crepes on a tin, previously lined with baking foil. 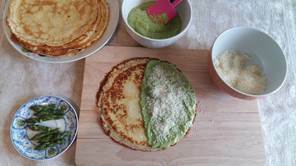 Pour the remaining sauce on top of the crèpes and sprinkle with grated parmesan. 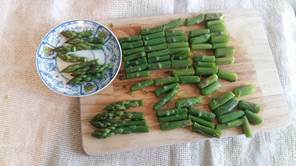 Decorate with the saved asparagus tips. Before serving the crepès, grill them in the oven for 5-10 minutes, until brown.